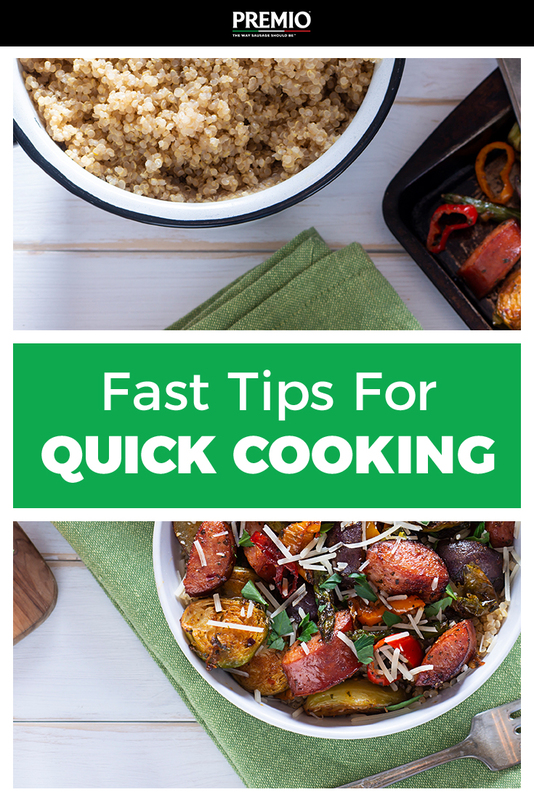 Fast Tips for Quick Cooking — Anytime! Home | Blog | Fast Tips for Quick Cooking — Anytime! Before you resort to another night of fast food or ordering takeout, consider this: preparing a delicious, nutritious meal can take less time. In fact, you can prepare a meal for one or for a whole household of hungry folks in under an hour. What is the key to being able to produce incredible entrees like quick, 30-minute sausage recipes for dinner or warm breakfast items without any fuss? Take the following tips into your kitchen every time you plan a meal. The next time you make a meal like sausage and peppers with zucchini noodles or Premio Foods sausage French Toast rolls, double or even triple the batch. This allows you to label and store the leftovers in your freezer. As long as the items are in airtight containers and used relatively soon after freezing, they should taste fresh and wonderful after thawing in the microwave or conventional oven. Plus, you may find that you save money by taking advantage of store discounts and sales. Remember learning in your science class that the less surface area an item has, the faster it will react to heat or cold? When you take the delectable meat out of any of our Premio Foods cased sausages, you can cut down on cooking time. As your sausage heats up in a skillet or pan, use a spatula to break it up into smaller bits and pieces. Then, feel free to use it in your favorite meals as an extra source of protein. You can even place it on top of salads for a quick, filling lunch pick-me-up. Be certain that you always have some time-saving sausage recipes available on whatever device you use the most. Spend some time picking and choosing options for various meals, and then bookmark their URLs. No matter what you, your family or your guests are in the mood to eat, you can order up a speedy recipe without digging through old cookbooks. What do the fastest cooks know? Basically, that they need to keep their pantry and refrigerator filled with essential items. These can include spices, seasonings, flour, canned beans, pasta sauce, canned vegetables, rice, pasta, a variety of vegetables, an array of fruits, olive oil, milk, eggs, cheese and meats such as your favorite Premio Foods sausage varieties. Having ingredients at the ready takes the guesswork out of what’s for breakfast, lunch or dinner. Still not convinced that you can chip away at the time it takes to pull together a delicious meal? The issue could be that you do not have the best cookware to get everything cooked in time. Invest in a slow cooker, large skillets and hefty casserole dishes. You may also want to purchase a new set of knives and other food cutting and preparing implements. Save your money and feast on the food you crave! Discover how easy it can be to cook quickly with these tips courtesy of Premio Foods. Then find a store that carries Premio Foods near you to load up on the ingredients you need to cook great meals fast.